This new job sells at the bottom of the medium-priced field, where it could start some fur flying. In my opinion, Henry’s offering is the best-looking one in this field and reflects more creative thinking than his rivals have shown since General Grant got his last shave. Uncle Henry recently shook down the Washington bubble-brain boys for a loan of just under fifty million bucks to keep his Kaiser-Frazer show on the road. This loan, children, makes us all stockholders in the venture and our only hope of getting dividends on the dough is: good automobiles. I sincerely hope the K-F boys make the grade with their new line. This would be an awfully dreary automobile country if the independents should fall by the wayside. Without them, double windshield wipers and redesigned ashtrays would be the big news in cars. Guys like Kaiser, with comparatively little to lose and everything to gain, keep the $500 million-a-year-profit moguls on their toes. The 1951 Kaiser Special has a brand-new 115-horsepower engine which, like those of the other two lines, has been dubbed “Supersonic.” The car is 60.25 inches high with a 118-1/2-inch wheelbase. The windshield, swept back at a 51.5 degree angle, contains 1096 square inches of safety glass, the largest area of any sedan in the business. The rear window is also the biggest in the industry. A particularly interesting change over previous models is the lowered center of gravity, which in the new Kaisers is below the tire line. This is a step in the right direction and, though there’s still room for improvement, one that puts Kaiser-Frazer ahead of its field. The new ignition key feature is a honey. One key opens everything, from the trunk to the glove compartment. This simple, single-lock system should have been made standard years ago. Thousands of tempers would have beep spared the spontaneous explosions suffered on frozen dark nights by car-owners fumbling for the right key for the spare tire. Simplicity, especially in the small details, is engineering genius. The front seats of the new Kaisers have a seven-inch back-and-forward adjustment range, plus provision for extra elevation as needed. Now you can sit taller than she does Don’t scoff at this as a piddling, exaggerated example of “engineering genius, huh?” It’s a fine feature which many foreign cars have had for years. None of our cars have offered it for a long time. One of the Big Three’s very top cars, for instance, has a front seat that must have been designed for a short-wheelbase, three-legged elk. In this “well-designed” elk trap, the seat can be adjusted only about as far as your chest can shrink on the exhale and if you want to raise the pitch for more comfortable leg room, you’d better get a pillow. So—another nod to the new Kaisers for an adjustable front seat that really adjusts. 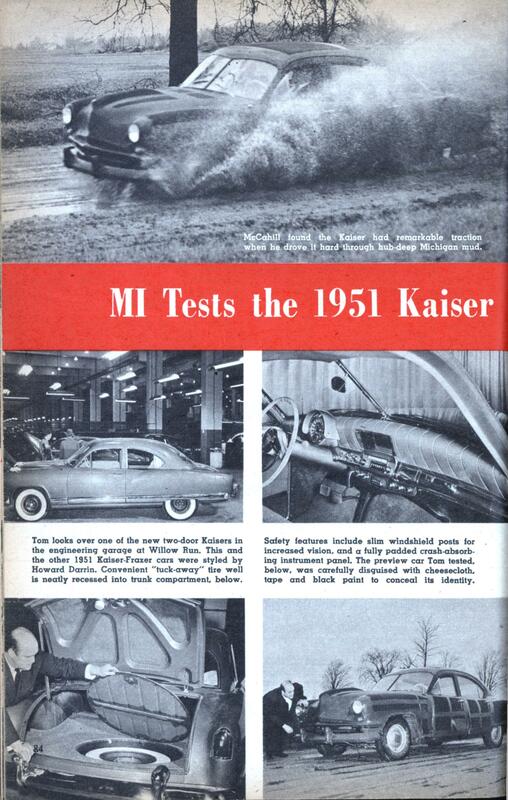 Kaiser-Frazer press releases claim the ’51 models have “the industry’s first full-padded crash-absorbing instrument panel.” Well, this is a worthwhile safety feature but look, boys, when you swipe somebody else’s “first” let’s give him a credit line. The Tucker (remember?) featured a similar gimmick. And so did the Chrysler Imperial roadster which Walter P. the First (in more ways than one) put on the market 20 years ago. Howard Darrin can take the bow for the styling of these Kaisers. Darrin goes for the slight continental touch and I’m all for it. He is one of the best in the business, though I have seen one or two of his previous brainchildren which I promise not to mention if he’s a real good boy. The Kaiser’s engine crankshaft is 100 per cent counterbalanced. This is more remarkable than it may seem. Most crankshafts are only partly counterbalanced. 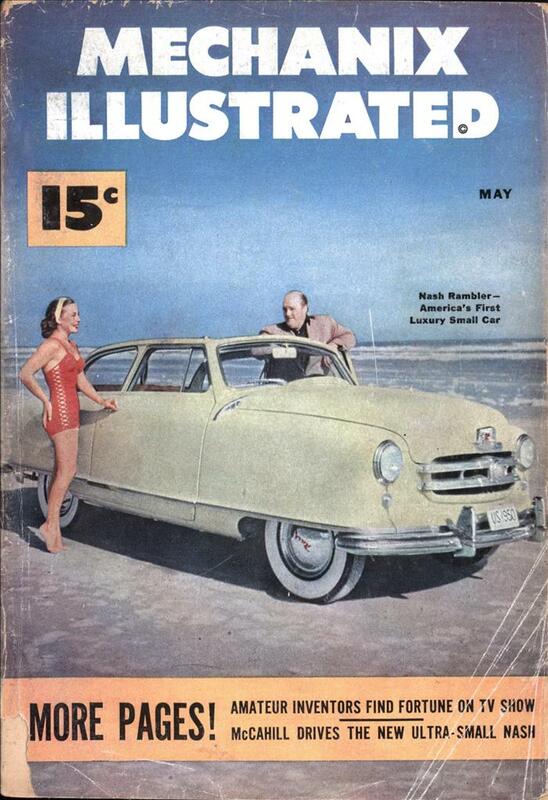 This feature, along with the others already mentioned, highlights the innovations in the ’51 models. So let’s get on with the performance test. It was one of the rainiest, clammiest, coldest, smoggiest days in the history of the Middle West when I arrived at Willow Run to test the Special. I was taken first to the engineering garage and shown most of the new models in various stages of completion. While I was there I tried to needle them into letting me test the other new offering, the baby 100-inch wheelbase Kaiser, which is scheduled for July production. There were none running (or so I was told) but I did get a look-see and a chance to sit in it. It looks good, which is where I will have to let the matter rest until I can bring you a full report. Like the Chrysler Corporation, Kaiser-Frazer doesn’t have a proving ground so they use Uncle Sam’s roads for their test runs. Operating from coast to coast, across mountains and deserts and under all other types of terrain and weather conditions, the K-F people pack thousands of miles on their test cars right out on the public highways before the production models go on sale. This presents a bit of a security problem when brand-new models are tried out because, as explained in the piece about the little Nash on pages 82-83 of this issue, it would be unwise to give the competition an advance look at the new line. Consequently, the car they turned over to me to test was wrapped up like an Egyptian mummy before I could take it out on the open road. Huge cotton falsies (those are bumps, Junior) were taped down on the hood, back deck and doors to conceal the lines of the car. At this point the beautiful Kaiser Special looked like a Warthog DeLuxe. Over these bumps they fastened a cheesecloth-like fabric which covered the entire body. Topping this came about 50 miles of wide tape, pulled down tight. Everything from hub caps to door handles was taped, then sprayed with black paint. By this time the Kaiser looked like a Lon Chaney nightmare. When I took off for the test in this King Tut sarcophagus, the roads in Southern Michigan resembled ports of embarkation for Noah’s Ark. For miles I drove, hard, through what had once been dirt roads but were now* just oozing mud holes. I found that this car has the best traction of any American automobile I have driven in years. Several times I expected to get out and start walking when the Kaiser dropped almost hub-deep into the goo, which was starting to ice up. But the Special kept right on going. When I got back to the Willow Runway for the speed trials, the mummified Kaiser was a sorry sight. Driving through the muck and rain at high speed had soaked and loosened the disguising tape so that I felt as though I were driving a large, wet, bandaged finger. The moment I started hitting some real speed on the Runway, the tape pulled loose and streamed out behind the car in trailers 20 feet long. Not the ideal condition under which to test any car’s true speed capabilities, but despite it I felt this ’51 Special showed remarkable performance—far superior to that of any previous Kaiser or Frazer. The new Kaisers can be ordered with conventional gear, overdrive or Hydra-Matic. My car had overdrive. Zero to 60 mph through gears took 15.5 seconds. Zero to 50 took 10 seconds. Zero to 70 mph I clocked in 23.1 seconds. To cover a half mile from a standing start took 33.8 seconds. Top speed was 90 mph-plus. Just how fast this car can go under normal conditions, I don’t know. Two top Kaiser engineers swore to me it would do better than 97. With the water-soaked taping pulling away and making driving conditions reasonably dangerous, it was impossible to boot it this high. For my records, therefore, I must rate top speed at 90-plus until I get another chance to drive a normal car.